Russian software makers and business people are beginning to recognize the important role of mobile applications for the new generation of smartphones. "On the Russian market, which simply 'exploded' after the start of official iPad sales, more and more companies are looking at mobile applications as a new medium for managing loyalty, a space for advertising, a way of digitizing business processes and so on," said Alexander Zveryev, general director of business software maker e-Legion. 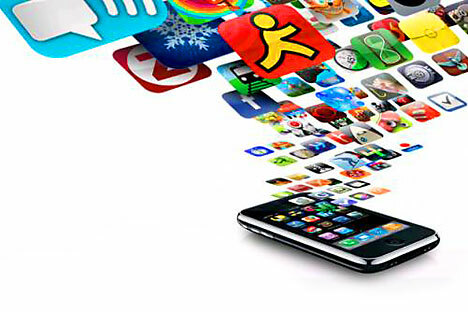 "The mobile applications market is one of the fastest growing in the world," Zveryev said. "There are already more smartphones in the world than personal computers. For the most part, this is thanks to Apple — they worked out how to get around the problem of piracy and how to give small companies the chance to make money by creating mobile applications." Last year, about 8 billion applications were downloaded globally, and some experts predict 20-fold growth by 2015. There are now more than half a million applications sold worldwide in stores such as AppStore, Google Android Market, BlackBerry App World, Nokia Ovi Store and Microsoft Marketplace, and they target both the casual user and the business sector. Alexander Savin, head of mobile advertising at Mail.ru Group, also remarked on changes in the format and volume of consumption for Russian mobile services. He said mobile applications are one of the key solutions for business in the mobile world. Microsoft is also keen to announce its latest products on the Russian market. Official sales of phones with Windows Phone 7 will begin in Russia simultaneously with the expanded version of the operating system, the release of which is expected in the second half of this year. "Already existing applications — e-mail, calendar, address book and mobile Office — will be developed to meet the specific demands of the corporate market, including improved integration with SharePoint and Office 365," said Vladimir Kolesnikov, a software development expert for Microsoft Russia's strategic technologies department. At "Mobility: How to Make Your Business Mobile," a conference held in St. Petersburg earlier this month, market experts demonstrated the various opportunities for users and advertisers. Alesya Chichinkina, representing Toozla.com, presented applications for mobile phones that combine GPS positioning with information about the surrounding area, such as excursions around historic sites and dining information. The tool can be used to deliver advertising directly to the user. For example, while a traveler is listening to a guided tour with Toozla, they could be receiving news on their phone from a restaurant a few steps away. Mobile devices are significantly altering the perception of the possibilities of the Internet among users, as well as creating new professions and new commercial opportunities. Developers and advertisers have been paying close attention to the Russian market from the earliest stages: In 2010, the number of smartphone and tablet users in Russia stood at about 6 million, a figure that is expected by some to triple by the end of this year.